The beautiful former capital, Mdina exhibits a strong Arabic influence, giving visitors a glimpse into the past - the history of Mdina goes back more than 4000 years. According to tradition, it was here, in 60 AD, that St. Paul is said to have lived after being shipwrecked on the islands. Furthermore, it is said that St. Paul resided inside the grotto known as Fuori le Mura (outside the city walls), now known as St. Paul's Grotto in Rabat. Lamp-lit by night and referred to as 'the silent city' Mdina is fascinating to visit for its timeless atmosphere, as well as its cultural and religious treasures. Mdina has had different names and titles depending on its rulers and its role but its medieval name describes it best – ‘Città Notabile’: the noble city. Impressive palaces line its narrow, shady streets. 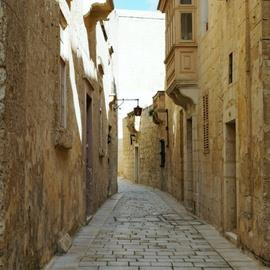 It was home then, as now, to Malta’s noble families - some are descendants of the Norman, Sicilian and Spanish overlords who made Mdina their home from the 12th century onwards. Choirs will love performing during Mass at the spectacular cathedral.